According to a new Gallup poll, 44% of all Americans say they’ve tried marijuana at some point in their lives, a number that jumps to 56% when looking specifically at the Nones (atheists, Agnostics, and those with no religious affiliation). The stigma associated with smoking marijuana appears to be loosening, and Americans may be less shy about revealing their experiences or habits than they have been in the past. For whatever reason, more Americans than ever before admit that they have smoked marijuana in the past, and there has been an increase in the modest percentage who say they currently smoke it. 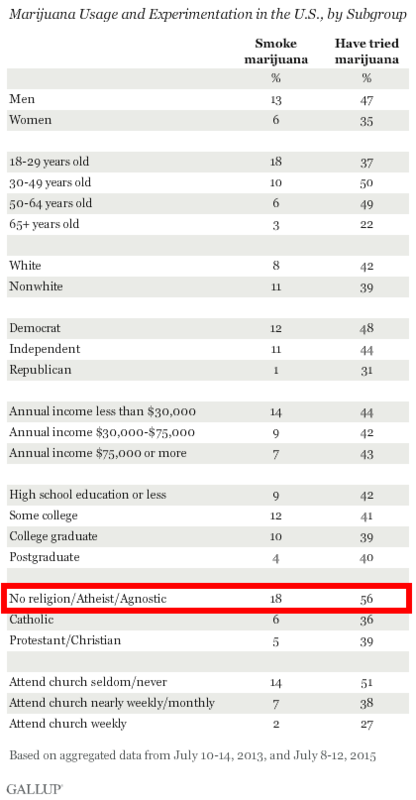 That 56%, by the way, is the highest percentage for any given subgroup. I suspect some people will use these numbers to argue that people without religion are immoral, as if the relatively harmless act of smoking pot is a sin that must be discouraged. I don’t buy that. I’m apparently in the minority here, never having done it, but it seems like you could also spin this to say we’re the ones more likely to follow the evidence. Contrary to what we may have learned about marijuana use growing up, it’s not a gateway drug, it has therapeutic benefits, and it’s not addictive for the majority of users. Another possible spin: Maybe some religious respondents lied about their pot use while the Nones were more willing to be honest.